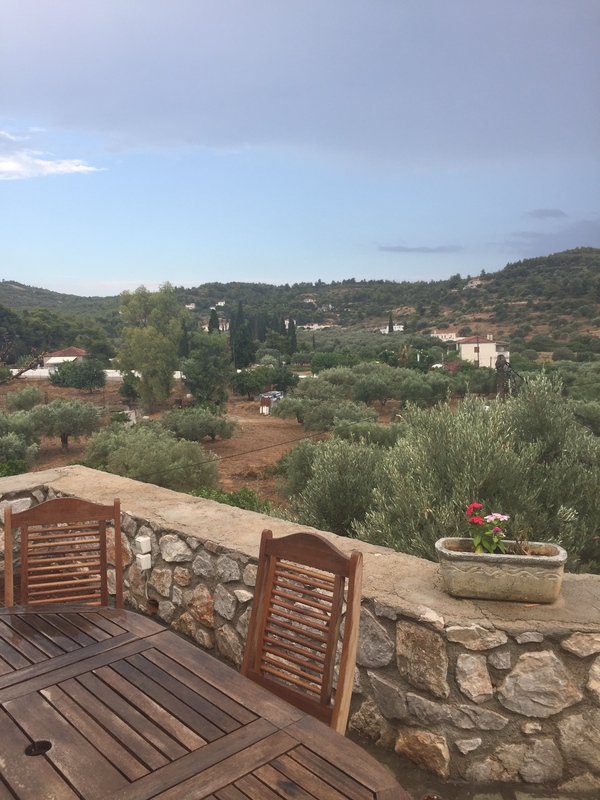 There was a fire at Aghii Anargiri yesterday, the place in Spetses where my parents have their holiday home and where we just left last week. To put the first picture into context, this is the view from the balcony. The House with the awning is the same house with the awning in the fire picture in the bottom left corner…the fire came down from the hills on the left. My mother was at the house – my father, sister, niece and three friends were all at another beach -Xylokeriza – they all made it to safety, though some with only the swimming costumes they were standing in. There was a huge fire in 1990 that many of us remember with horror: Nothing can prepare you for the sound, noise, speed, smell. The difference with this fire was it started in the morning which gave the helicopters and water planes a chance. The downside was the high winds, ready to whip the flames back into action. 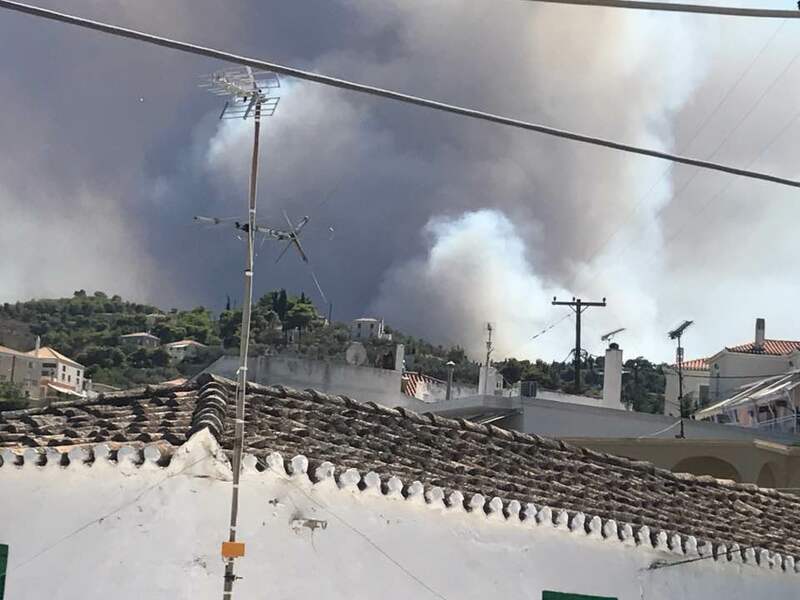 The wildfires on the Argosaronic island of Spetses and at Anavysos, east of Athens, were under control on Wednesday morning after a difficult night with strong winds that threatened to fan them further. 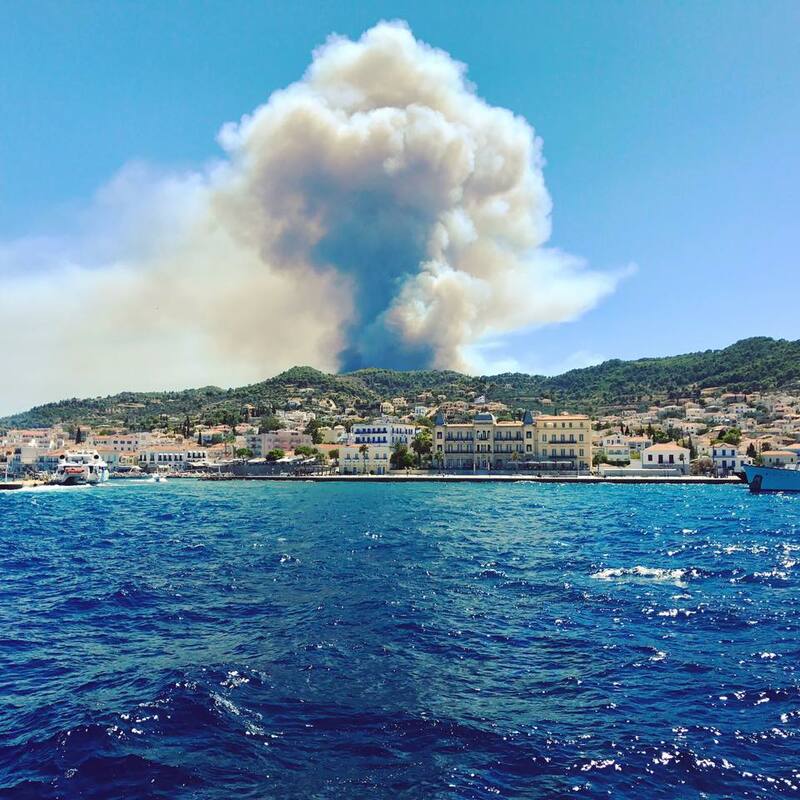 The forest fire on the southwest part of Spetses appeared to be contained by the dozens of firefighters on the island. The fire broke out on Tuesday at noon at the forest near Aghii Anargyri, near the top of the island’s mountain, and headed west toward the beach before swinging south toward Xylokeriza. This is the same forest area that suffered from the 1990 wildfire. It has undergone extensive reforestation. The few scattered holiday homes in that area were not damaged, thanks mainly to the rapid response of the local and regional fire service. 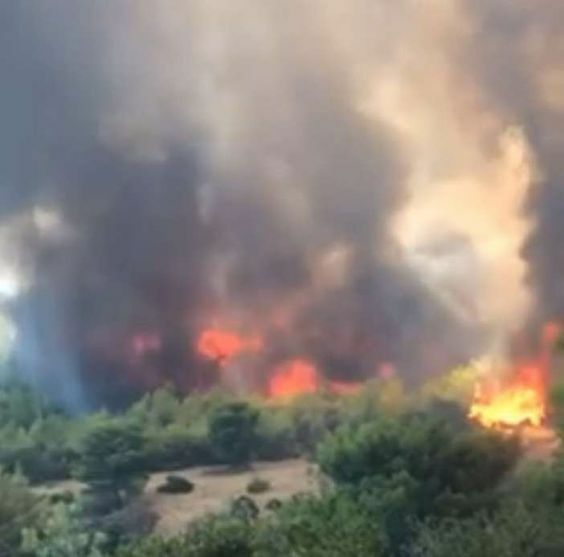 Six helicopters and at least three airplanes contributed to the battle with the fire on the touristic island up to late in the evening on Tuesday. A helicopter and two aircraft resumed operations on Wednesday morning along with 70 men on the ground plus many volunteers. The island’s mayor Panayiotis Lyrakis spoke of a possible arson, on which his deputy, Paraskevi Stofyla expressed her certainty. Swimmers at the popular beach of Aghii Anargyri were evacuated with sea taxis as the flames appeared particularly threatening. “The blaze passed passed by 10-11 holiday houses but fortunately there was no damage caused,” stated Lyrakis. My family are now making their heartbroken way back to their house. This was the stunning bay of Xylokeriza, where most of our group were swimming that fateful day. Whilst grateful that lives are safe, all who know this place as a heavenly paradise will appreciate the sense of grief and bleakness to see it so ravaged and hurt. We await to see the pictures of our beautiful bay. Oh my gosh! How awful. Glad everyone is okay!